The United States Coast Guard uses cutters and small boats on the water, and fixed- and rotary wing ( helicopters) aircraft in the air. The Coast Guard employs various small arms including handguns, shotguns, rifles, and machine guns. The Coast Guard formerly leased 179-foot Cyclone-class coastal patrol ships from the U.S. Navy. All are homeported in Pascagoula, Mississippi. These vessels were used primarily for counterdrug patrols. Four have now been returned to the navy. 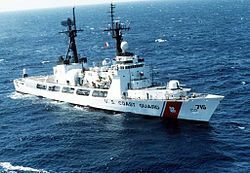 Polar Security Cutter: The Polar Security Cutter Program is the program to replace the United States Coast Guard's aging fleet of icebreakers. Polar-class icebreaker (WAGB): There are three WAGB's, all home ported in Seattle, Washington. Two are 399-foot (122 m) icebreakers ( Polar Sea and Polar Star), and one newer 420-foot (130 m) icebreaker, Healy. High Endurance Cutter (WHEC): These are 12 Hamilton class cutters, 378 feet (115 m) along the waterline. Only 3 still in use, with 8 having been transferred to the Philippines, Bangladesh, Vietnam, and Nigeria. USCGC Mackinaw (WLBB-30): Mackinaw is a 240-foot (73 m) heavy icebreaker built for operations on the North American Great Lakes and home ported at Cheboygan, Michigan. USCGC Eagle (WIX-327): Eagle is home ported at the Coast Guard Academy in New London, Connecticut. 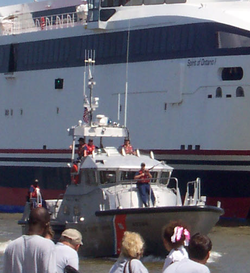 It is used for training voyages for Coast Guard Academy cadets and Coast Guard officer candidates. USCGC Eagle was built in Germany as the Horst Wessel, and was taken by the United States as a war reparation in 1945. 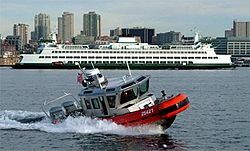 The Coast Guard operates about 1,400 boats, defined as any vessel less than 65 feet (20 meters) in length, which generally operate near shore and on inland waterways. The most common is 25 feet (7.62 m) long, of which the Guard has more than 350;  the shortest is 12 feet (4 m). Response boat - Small II: A small multi-purpose boat designed to replace the Defender class boats. 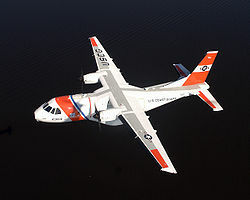 The Coast Guard operates about 210 aircraft. Fixed-wing aircraft (such as Lockheed HC-130 Hercules turboprops) operate from Air Stations on long-duration missions. Helicopters ( Aérospatiale HH-65 Dolphin, Sikorsky HH-60J Jayhawk, and Agusta MH-68 Stingray) operate from Air Stations, Air Facilities, and flight-deck equipped cutters, and can rescue people or intercept smuggling vessels. Some special MH- designated helicopters are armed with guns and some are equipped with armor to protect against small arms fire. 11 HC-27J Spartan   Out of 14 on order. An unspecified number of RG-8A Condors. The Coast Guard is planning to purchase 36 CASA CN-235 from Spanish aircraft manufacturer Construcciones Aeronáuticas SA (CASA) for medium range search. As of 26 February 2008, 3 aircraft have been delivered for testing and integration with a further 5 planned. During testing, one aircraft was pulled into active duty for the search of downed Air Force pilots, in which the aircraft demonstrated its capabilities. The current communication system is the Rescue 21. Rescue 21 is an advanced maritime command, control, and communications (C3) system. ^ USCG Regulations. Chapter 10. Accessed 11 December 2006. ^ PA3 Brian Leshak, "CG Leases Navy Ships, Fights Drug War". Coast Guard Magazine 2/2006, pp. 32–33. ^ "PATROL COASTAL SHIPS - PC". Retrieved 6 December 2017. ^ "Our Opinion: Shipbuilding issues should be solved". The Mississippi Press. July 23, 2007. Archived from the original on January 24, 2013. Retrieved 2007-07-23. ^ "Operational Assets". U.S. Coast Guard}. Retrieved 8 August 2018. ^ U.S. General Service Administration. " Boats Transferred to Iraq". Accessed 4 September 2007. ^ "Enhancing our ability to protect, defend the maritime domain". coastguard.dodlive.mil. Retrieved 28 June 2017. ^ "Keel Laying Ceremony Marks Production of New Response Boat" (Press release). United States Coast Guard. 2007-06-28. Archived from the original on 2007-10-11. ^ "Metal Shark 24 Relentless (SPC-SW)". Metal Shark Aluminum Boats. ^ "Metal Shark 38 Defiant". Metal Shark Aluminum Boats. 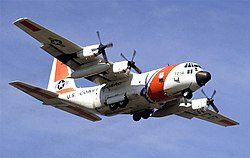 ^ "USCG receives 11th regenerated C-27J". Naval Warfare International. 20 February 2017. ^ Air Forces Monthly. Stamford, Lincolnshire: Key Publishing Ltd. March 2013. p. 31. ^ "EADS North America Delivers 15th HC-144A Ocean Sentry to U.S. Coast Guard". June 7, 2013. ^ "Airbus Group, Inc. delivers U.S. Coast Guard with its 16th HC-144A Ocean Sentry Aircraft". January 22, 2014. ^ "US Coast Guard to Launch sUAS Competition". www.uasvision.com. Retrieved 24 January 2018. ^ "Port Security Unit 305 provides anti-terrorism force protection in Guantanamo Bay, Cuba". coastguard.dodlive.mil. Retrieved 26 August 2017. ^ "Everyday heroes tasked with extraordinary duties". www.flickr.com. Retrieved 26 August 2017. ^ PA2 John Edwards and PA1 Kimberly Smith, PADET Atlantic City. "Learning to Shoot All Over Again". Coast Guard Magazine, Issue 2, 2006, pp. 4–19. 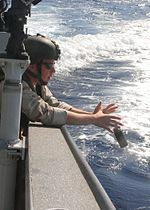 ^ "Anti-Swimmer Grenade offers underwater port security". www.navair.navy.mil. Navair.navy.mil. Retrieved 28 January 2017.